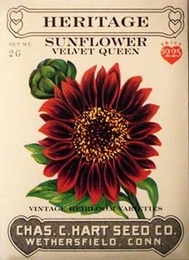 The nearly black center of this rich maroon sunflower has been described �as if it were unshorn velvet� (John Gerard). Every part of the sunflower was used by Native Americans and pioneer families. New shoots were eaten like asparagus, seeds were eaten or pressed for oil, leaves were used as fodder, petals produce a good quality dye, and fibers from the stalks were used to make cloth. These 6 foot tall sunflowers are well branched and free flowering making them ideal for cutting. Continuously blooms from mid-summer until frost. Sow seeds directly outdoors in a sunny location 2 weeks after the last spring frost. Cover seed with 1/4 inch of fine soil. Thin to 18 inches apart.